Celebrating International Women's Day and the FDA centenary, Craig Ryan looks back on the life of our first woman President. Dame Alix Kilroy, elected as the FDA’s first woman Chair in 1944, was one of the most remarkable women in civil service history. A gifted administrator and policymaker, she was one of the very first women to break into the senior ranks of the civil service, and a tenacious but independently minded campaigner for fairness and equality. Born in 1903 in Nottingham, the young Alix grew up under the tutelage of her mother’s large, close-knit family, the Dowsons. “Their attitude to life, their liberal convictions, and their support of Women’s Suffrage were to be a very powerful influence. They made me who I am,” she wrote in her memoirs. Bright, self-confident and “clearly bossy”, she quickly emerged as the family leader. “I have always felt that I was grown up at seven,” she said. 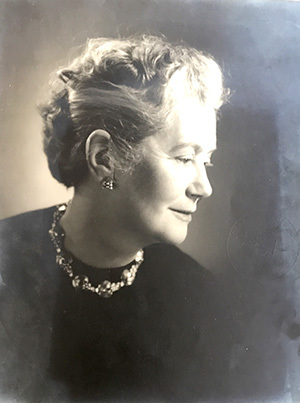 Kilroy studied politics, philosophy and economics at Somerville College, Oxford, where she met Evelyn Sharp, a lifelong friend and later the first woman to head a Whitehall department. The heady intellectual atmosphere at Oxford made Kilroy feel “larger than life”, she said, describing her tutor’s first question – “Yes, but what do you think?” – as “the most exciting question I had ever been asked”. But Kilroy’s pioneering career was almost accidental; she only sat the Administrative Class examinations in 1925 – the first year they were open to women – as an “insurance policy” against not getting a job as a barrister. Kilroy was ranked twelfth – one of only two women out of 200 applicants admitted that year. Her sister Bimbi was placed top of the reserve list, but not a single department declared a vacancy that year – a deliberate ploy, Kilroy believed, to avoid recruiting another woman. She began work as an Assistant Principal in the Board of Trade on 25 October 1925, on a salary of £240 a year (around £14,000 in today’s money). Typically, she continued to study law and passed the Bar exams in 1928. She claimed later that her legal training helped her to win arguments in her civil service career. Her appointment was “received with horror by the Board of Trade establishment,” Kilroy said, “for it forced them to become leaders in the experiment of employing women in positions of responsibility.” Nevertheless, she experienced less overt discrimination from senior colleagues than expected. “I only had to nag a little to get fair treatment as a woman”, she wrote, “but I have no doubt – indeed I know – that it has often been harder for women in the junior grades of the Service.” She saw her election as FDA Chairman (the title wasn’t changed until 1988) as “a clear sign of the absence of prejudice” among her colleagues. In her year as Chairman, Kilroy led the FDA in talks with the Treasury about the post-war shape of the civil service. The Treasury acknowledged the talks were of “considerable benefit” but was later forced to terminate them after objections from other unions. Kilroy also stepped up the FDA’s campaign for equal pay, and pressed the Government to abolish the bar on women civil servants marrying or working in the Diplomatic Service. Both restrictions were lifted in October 1946, two months after Kilroy herself had obtained a waiver to marry her lover of many years, the publisher and poet Francis Meynell. Kilroy also presided over the admission of hundreds of temporary wartime civil servants to the FDA, despite opposition from many branches. But the Treasury resisted her efforts to persuade the Government to retain some of the temporaries “to ensure that the peace and the reconstruction to follow this war will not be made by tired men and women”. Most were let go as soon as the war ended, representing what Whitehall historian Peter Hennessy described as “the greatest missed opportunity in the history of British public administration”. After the war, Kilroy briefly achieved tabloid notoriety as the “short-skirt champion” by speaking out against the longer hemlines inspired by Christian Dior’s ‘New Look’, and was even summoned to the Palace after the then Queen complained that her allocation of 300 clothing coupons – eight times the standard ration – was insufficient. Kilroy stood her ground, later diplomatically suggesting that the objections probably came from the Royal Household rather than the Queen herself. Kilroy remained active, serving on the boards of South Eastern Gas and the Harlow New Town Corporation, and returning to the MMC as a commission member. In her old age, she became involved in party politics for the first time, standing (unsuccessfully) for the SDP in local elections at the age of 83. The FDA is proud that a woman of such courage and tenacity as Alix Kilroy saw the union as a worthwhile vehicle for change and, 75 years ago, was able to become the first woman leader of a very male-dominated union and blaze a trail for other women to follow. Craig Ryan is the editor of the FDA's Centenary Project.